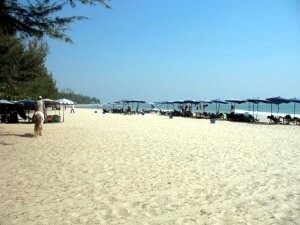 The main attraction of Cha-Am is the long and beautiful beach. 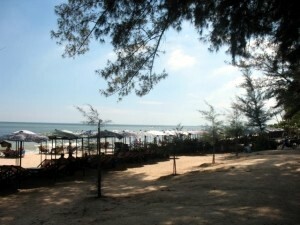 You can sunbathe or stay under the shade of the big pine trees, you can go ride a jetski or just do nothing but relax! 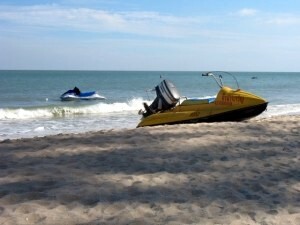 Popular water sports in Cha-Am include riding the banana boat and renting a jetski. 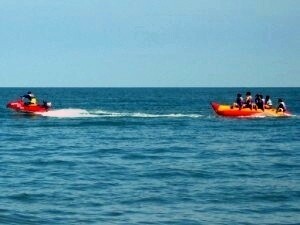 There is no parasailing, windsurfing or water-skiing. 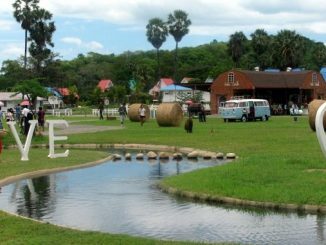 It’s also possible to go horse riding (but there are not as many horses as on Hua Hin beach), or to rent a bicyle or a motorcycle and ride along the beachfront or go exploring the countryside. For more information, see our page about means of transportation and renting a vehicle. 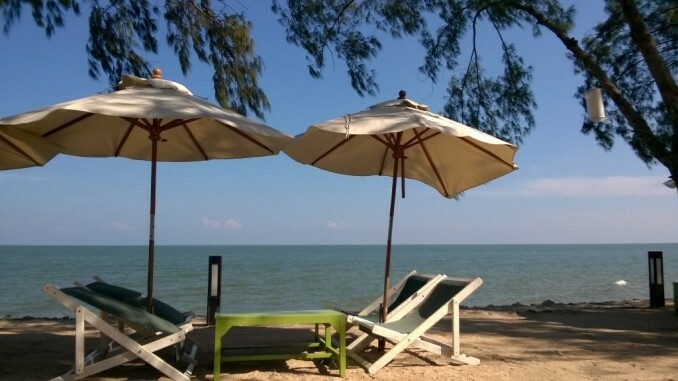 Beach chairs are for rent (usually 50 baht per person for a few hours), unless they are courtesy of your hotel. Drinks and food are available from anywhere on the beach (just ask the persons who rent the chairs). Parking a car on the beachfront is free. The persons “in charge” of the part of the beach where you are parking may ask you to move the car a little bit to the front or to the left, but they shouldn’t ask for money. 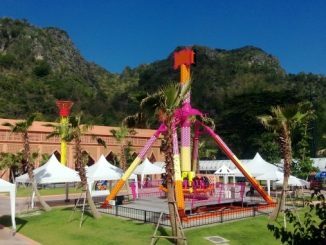 Unlike Hua Hin, where driving and parking is a nightmare, there are plenty of park spaces in Cha-Am. If the beachfront is full (it can happen on busy week-ends), you can easily park in the second road running parallel to the beachfront, where there are more spaces available. 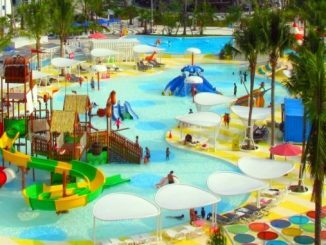 Besides hotels, guesthouses and restaurants, there are also many places along the beachfront where you can have a shower (for 10 baht) or go to the toilets. Ask around or, if you can read Thai, look for the signs that say “ap nam jeut/sukhra”. It comes handy if, for example, you spend only one day in Cha-Am and you don’t have a place to stay. Should be 30 baht per chair.